I must admit that I haven’t got round to trying many new recipes over the last couple of months, but this is one of the desserts I made over Christmas – I always look forward to trying chestnut recipes when the autumn arrives, but didn’t get a chance to until December this season. I’ve posted about a couple of chestnut desserts here and here, and this time I tried Mont Blanc with poached pear and chocolate sauce from a beautiful book, Season to Taste by Liam Tomlin. Although all the components were simple to make (and you can make them in advance), it involved some unfamiliar steps for me – slicing the pears really thinly and drying in the oven (with a sprinkle of icing sugar) was definitely a job for the mandolin; I’m glad I could use it as it’s one of the gadgets that tends to be neglected in my kitchen (even though I specifically asked Matthew to get me one as a Christmas present a couple of years ago…). When done, they need special care when removing so as not to break them (I did) – they are so thin and crispy! In between the layers of chestnut puree (mixed with vanilla bean and lightly whipped double cream) are honey cinnamon flavoured tuilles – subtle but it certainly adds another dimension to the dessert. I especially loved the combination with the espresso poached pears (cooked in espresso + plain syrup), they’re so lovely together not to mention the chocolate sauce. By the way, I got the special Mont Blanc piping nozzle from here a long time ago. 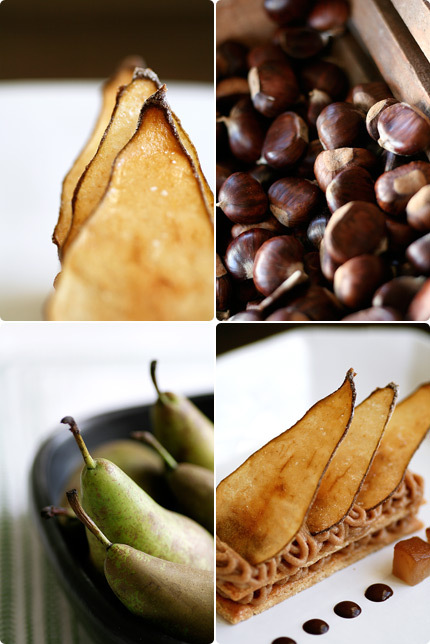 Can’t be bothered going through all the soak-skin process to make chestnut puree? I’d definitely recommend trying it at least once, it’s full of flavour and you can’t beat it (I normally cook them in milk after skinning, add sugar towards the end then sieve) – but it does take a long time and you can make a much simpler version of Mont Blanc using a good puree like this or this. Just make meringues (I guess you can even buy those, but surely you can be bothered making them :)) and top with some chestnut puree and cream of your choice (I prefer whipped double cream but you can use fromage frais, creme fraiche or even mascarpone). It can’t be easier than that! Happy new year to you and Matthew (and the kitten too). How beautiful! And pears with chestnut paste! I think I’ll head out to the store now, it looks so delicious. Hope you had a wonderful holidays Keiko. The mont-blanc is stunning, like a winter landscape. What a beautiful way to start the new year! beautiful mont blanc. I like the idea of using the pears on top. Happy new year and as usual gorgeous photo and recipe. Now I use a frozen “purée de marrons” “Ravifruit” easier to use ! Lovely. Simply breathtaking. I can only imagine how crispy those thinly sliced pears were. Did you use any sort of lining on the baking sheet to ensure they would seperate? Wow, looks truly lovely. I received a new mandolin for Christmas this year and maybe this is just the recipe to christen it! this is such a lovely new year post. Is The Last Course your favourite book? Claudia would be immeasurably happy. To this day I use tricks I learned under her reign. And as well as all the hard work Mont Blanc takes, it’s such a whimsical looking sweet— with those strangs of chestnut noodly hair! Hi Keiko – Happy New Year! I spotted the recipe and picture :) of this mont blanc with poached pears the other day at Waterstones and it made me want to buy the book straight away. Sadly I didn’t as one of my resolutions is to try to buy less cookbooks. Welcome back in the new year. Liam Tomlin ran one of Australia’s most famous restaurants of recent times and although I haven’t got a copy of his book, I have had the chance to read it. Like you said, it’s an inspiring and wonderful book with beautiful images. This dessert looks absolutely delicious! I have a recipe for you with chesnuts!It’s a frozen and carmelized thing we used to make years ago at this restaurant I worked! Will send it, happy new year and check out my Ecuador trip on my site! So delicate and pretty Keiko! You are the real pastry master! Happy New Year to you! Beautiful dessert Keiko. Happy New Year. I look forward to your 2007 creations. Hi Keiko, happy new year to you. I stumbled across your website as I needed some comforting images, (can’t eat anything thanks to a stomach bug my flatmate generously shared). I’ve never been huge on pudding, (I rather go for a starter), but these tantalising images and the recipes you’ve provided have opened my eyes (and my palate), to a world of desserts that have yet to be discovered. For this, I thank you and shall attempt this fine art myself as a new years resolution! Himmm yummy! I love chestnut, I am sure they go very well with pears. Great photos, as always! The detail in your dishes are really impressive! Drying fruit in the oven is something I haven’t managed to do … maybe a case for me to buy a madolin. keiko, this is absolutely gorgeous and delectable! you’ve got my vote in foodblog award! what a lovely dessert.. once again! although i’m really not fond of pears or chesnuts, the delicacy of your presentation makes me want to eat it!! i’m glad you’re back! Hi keiko , what a beautiful dessert! I am curious about the chesnut souffle, I am sure it is very flavorful. 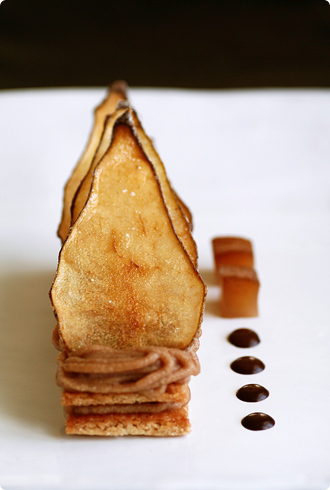 And espresso poached pear…that is an interesting combination! 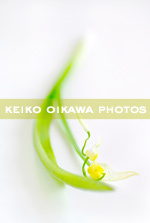 Keiko- your photos are so gorgeous. I am enthralled by the photo of the meringues! they are so simple & elegant. Just lovely! Great photography as always. Thanks for posting, I always enjoy your site. The bottom right photo in the first set of four is my favorite, I like the composition and repetition of the pears and the dots. I wish I had the skills to make this stuff, you always make it look so tasty! This is absolutely amazing! I really need to get a mandolin so I can make these paper-thin slices as well! Waaaaow! I hate “meringue” in general, so I try to avoid Mont-Blanc as it’s usually full of sugar-&-eggwhite-dust ;) This one with pears and tuiles is more than correct! About the chestnut puree: I always add 1tbsp amber rhum, and 1tbsp (full full full ;) of Amaretto. Just in case you’d like to change ;) Oh, and Happy New Year! Happy New Year, Keiko! I love chestnuts too. I roast my own for eating (still warm), but I don’t think I will ever make my own paste. But who knows…I want Desserts from Gramercy Tavern now! I just watched Nigella make Mont Blanc and now I see your beautiful post. I will have to try it! Elegant and delicious as always, Keiko. I had a good chuckle at your mandoline comment. I too asked my wife for one several years ago, then never used it. It wasn’t until I started preparing El Bulli recipes that it became an essential part of my kitchen arsenal. Now I can’t cook without it. That looks amazing. I never seem to have to patience to make sophisticated desserts (evem thoug I sure like to eat them!) but I really admire your dedication. Your pictures are beautiful, too. Absolutely beautiful. So much so, that I can almost forego the recipe and just eat the page. Truly. I haven’t checked your blog in such a long time – which is a shame. You never fail to astound me with your photography skills – among the best on the food blog scene. I did not really understand what is the meringue for…could you explain? dear keiko, what a sublime take on a dessert classic! but of course, being japanese, it is virtually your birthright to perfect the mont blanc ;) thanks so much for sharing your thoughts on the liam tomlin title – now i really want, erm, need, it! those paper-thin pear looks unreal! as always you made mouth watering creation. Hi everyone, thank you so much for all your kind notes and wishes – I hope you all have a wonderful 2007! Stephanie – I used a Silpat for that (it specifies to do so in the book). Flux – hope you’re feeling better now… take care. 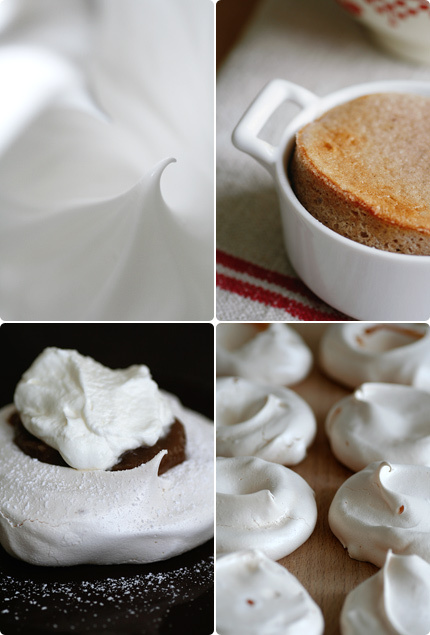 Elaysa – the meringues are just for a simple mont blanc – use them as a base like the picture above. I really enjoy your photography. The macro shots are always well-lit. What sort of gear are you using to get such great lighting? gorgeous as usual. I tasted the Mont-Blanc a few weeks ago and it was terrific! aww..there are just too preety to bite on now, aren’t they ? :) By the way, they looked absolutely beautiful, thx for sharing. great I just love this style of photography. I can taste it just by seeing the delicious food. Absolutely beautiful, Happy New Year Keiko san! Just discovered this website by accident (a “cornice pear” google). AMAZING stuff. Beautiful work. Keiko, are you a professional pastry chef? Look forward to visiting this site again and again. Are any of the recipes published on the website or am I being blind and missing the link? Tatina send a great kiss to you.. Sorry, but I speak english very bad…!! Hi there, thanks again for all your kind notes. Jef – I only use natural light, which is quite hard in the grey British winter! Hungrygirl – I don’t always post recipes but there are some. When I don’t I always note where the recipe comes from. Mmmm I love deserts with chesnuts! I am very impressed by people who can make pretty looking pastry – mine always look a bit wonky. Your pics are beautiful! Your blog is so beautiful ! that is the most gorgeous mont blanc i have ever seen! your blog is amazing! I already feel we know each other since I have read your entire blog and have ordered many of the books you like. My first book “Indulgence” arrived today and I absolutely love it. I cannot wait to make something out of it this weekend. Your blog is the best there is and I thank you for it so much. Please keep posting since I ge such pleasure of the photos, and every word you write. Hi Katy – thank you so much for your kind note, I’m glad you like the book – I think I prefer her simple recipes like shortbread, scones or madeleines over the complicated ones, how are you finding it so far? I agree with her that you need to use metric in order to measure the ingredients precisely (which is essential in pastry making), I must say I always have a hard time using American cookbooks that don’t have metric! Having said that, you must have amazing produce in California though! Hi Jack – you can find the recipe in Season to Taste by Liam Tomlin.